Where is God When We Need Him Most? I installed a new garage door opener today. For some, doing such a thing wouldn’t seem like such a feat, and a few years ago, it wouldn’t have been for me either. But, since going back to school I am more likely wear the letters off keyboards (the H, N and M are disappearing off of this nine month old Samsung) than I am to wear out any of my tools. They hang patiently in the shop, waiting. About a month ago our garage door opener committed hari kari, grinding its inner gears to oblivion. We’re not sure if the opener’s demise had anything to do with the service guy turning up the power of the machine after it didn’t want to lift the door all the way on cold days, but none the less, it is done. J got busy signing up for sale notifications at Canadian Tire for a replacement and last night, notified, we went in a picked up a new one at 40% off. 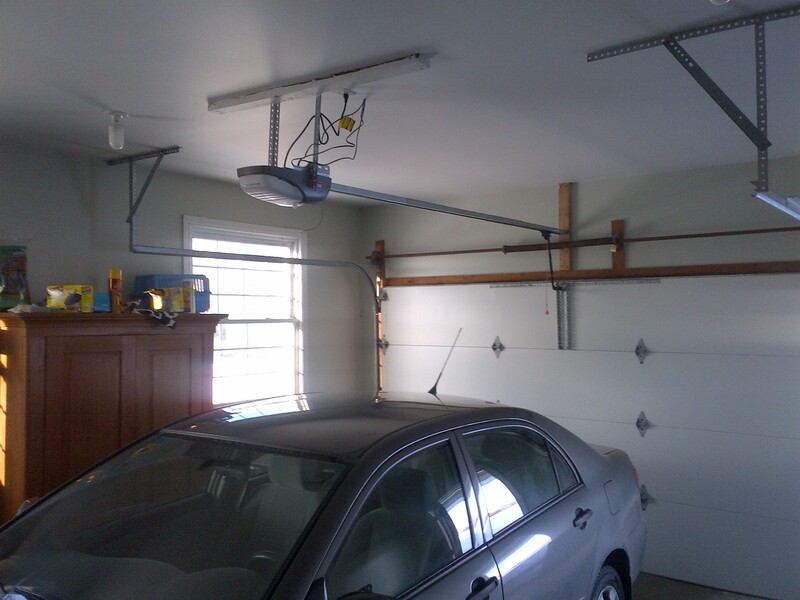 It’s just a garage door opener, but it was my Saturday project. Of course, it all comes in pieces and while the instructions were pretty good, they didn’t always match the pieces in the box, I likely ended up putting it all together twice. Then there was the trip into the attic to figure out which wires were which since we were able to use the hook-ups from the old unit. The wiring was covered with six inches of blown cellulose insulation which made the job of finding and identifying the wires more difficult. Never the less, the new unit is up and working, and for an afternoon I was able to use my mind and body for something other than writing. There is a feeling of satisfaction in that. This entry was posted in Uncategorized and tagged best friend, Blessing, books, purpose, work by farminarian. Bookmark the permalink. It would have taken me a week to figure out! I’m sure you could have done it. There was a big poster, complete with pictures. Finally got it to run properly today. The issue wasn’t the opener though, the door needed lubricating!! !